Spouting & Gutter Topper - SAM S. SMUCKER & SONS INC.
It’s a fact: You have a life. Sam S. Smucker & Sons, Inc. understands that you have enough to do without having to spend hours up a ladder, pulling leaves, pine needles, and who knows what kind of debris out of your gutters. While tools such as a blower or leafblaster can you save you time, effectively using these heavy, cumbersome tools perched on a ladder can be a messy and dangerous chore indeed. We also know that when it rains, it pours – all over your roof, clogging your debris-filled gutters and sending water all over the place. 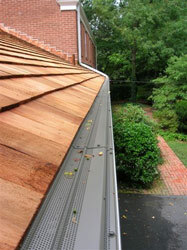 Gutters are vitally important in directing the water away from your home and keeping your roof and walls safe and dry. That’s why Smucker offers affordable, professional on-site spouting and gutter cleaning services at your convenience. Our friendly, knowledgeable staff is trained to do the best job possible to keep your gutters in tip-top shape! Contact us today for more information, to schedule a service call or request an estimate! We offer spouting and gutter cleaning and gutter covers to south central PA, including Lancaster, Lebanon, York, and Chester counties. Keep you off of the ladder and on the ground! Contact Smucker today to find out how easy it is for us to install our leaf guards and gutter guards over your existing gutter system. Our simple system locks into place over your gutters to cut down your maintenance costs and keep you off of the ladder, and on the ground, enjoying the view of your beautiful gutter guards and leaf guards. Request an estimate today, or contact us to schedule a service call when you’re ready! Your Smucker professional will guide you through the options, choices, and installation process. From there, you can relax…Smucker has you covered! Sam S. Smucker and Sons is a national award winner for Gutter Topper and Leaf Terminator Installations!